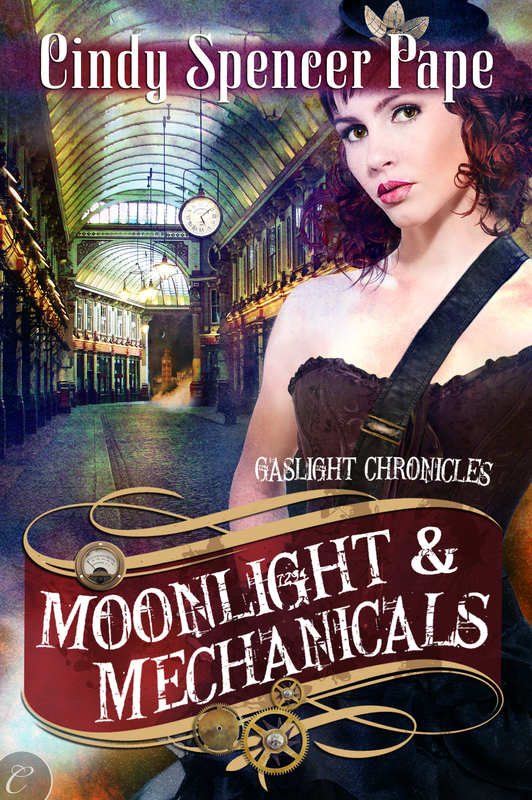 Having spent all day today (Tuesday) working on the final edits for Moonlight & Mechanicals, coming in October of this year, I’m definitely in a steampunk state of mind. Earlier this week I drafted proposals for two new steampunk romance novels, so I’m on a roll, which feels awfully darned good! I’m also excited to be attending and speaking at the World Steam Expo in Dearborn, Michigan this weekend, and have been mulling over my costume options for days. (okay, maybe weeks–I love playing dress-up!) There are some wonderful main author guests, including Gail Carriger, but I’m delighted to be part of a local author panel on Monday, with the fabulous Seleste DeLaney, Steven Harper, and David Erik Nelson. Hopefully we can show the world that southern Michigan is a force to be reckoned with in the steampunk world. If you’re in the area, I hope you’ll think about dropping by and saying hello. I hope to have a full report from the Con for my next blog. 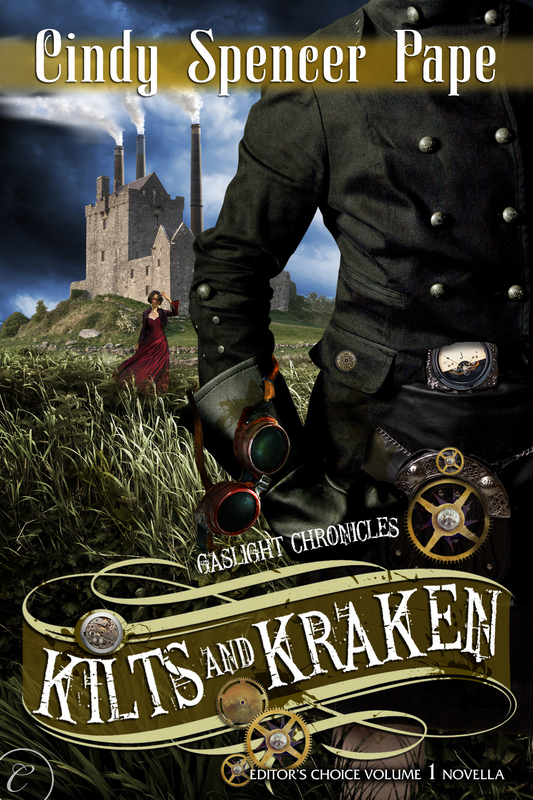 The icing on my steam-covered cake, however, is the upcoming release of Book 3 of my Gaslight Chronicles series, Kilts & Kraken from Carina Press. The book releases on Monday, June 4, but you can preorder it now at Carina, Amazon, or Barnes & Noble. It’s also available as part of Carina’s anniversary collection: Editor’s Choice: Volume I.
Blurb: Magnus, Baron Findlay, longs to bring the wonders of the steam age to his remote island home, but his hands are full fighting the vicious kraken ravaging the coast. When he’s swept to sea during battle and washes up on the shore of an isle in the Hebrides, he is near death. The darkness tried to drag Magnus back into its depths and he had little will to fight. It was comforting, this darkness, warm and free of pain. You’ve struggled enough, it seemed to whisper, let go. Magnus tried. The rich, feminine voice held the soft burr of a lowlander, with educated overtones. How had such a one come to his island? How had he not known? He was laird of Torkholm, and all who came here had to be approved by him. “Who are you, sir? Won’t you at least wake and tell me your name?” Soft, cool fingers stroked Magnus’s forehead. He moved his lips to answer the lass. From the silkiness of her touch and the sweet scent of her leaning over him, he might have thought her an angel, but he knew better. Dead in battle or not, he’d have never ended up in Heaven. A valkyrie, perhaps? The Valhalla of his Norse ancestors was a far more likely fate for him than the vicar’s pearly gates. “He’s in God’s hands,” said another female voice, a little older, a little deeper, and oddly familiar. A door opened and closed, but he still felt the touch of strong, feminine hands, the fingers laced with his own. At long last Magnus was able to unglue the lashes on one eyelid. The light in the room blinded him for a moment, but his vision adjusted and soon he was able to see. A woman sat by his bedside, her flowing hair the color of his favorite roan stallion. Her fingers tightened on his as she realized he’d woken. “T-Torkholm,” he gasped between lips as cracked as a mud path on a hot day. The cool liquid felt wonderful on his parched lips, but a single sip was all he could manage. He blinked again, this time both eyes focusing on her. “Magnus Findlay.” His name seemed to be dragged from his lips. Pain seared through him from more places than he could name, and he’d never once felt this weak. What was wrong? Why hadn’t the island healed him, as it always did? He blinked again and the answer swam into focus, for a moment at least. This was a strange room—one he’d never seen before. Magnus sagged back against the woman’s arm, and let her ease him down to the pillows. The darkness began to close in again. One thought registered, ringing through his brain. He wasn’t on Torkholm. He was going to die. It’s Book Monday. For those of you new to the blog, Book Monday is an occasional feature where I talk about books I really love that I think you’d enjoy as well. 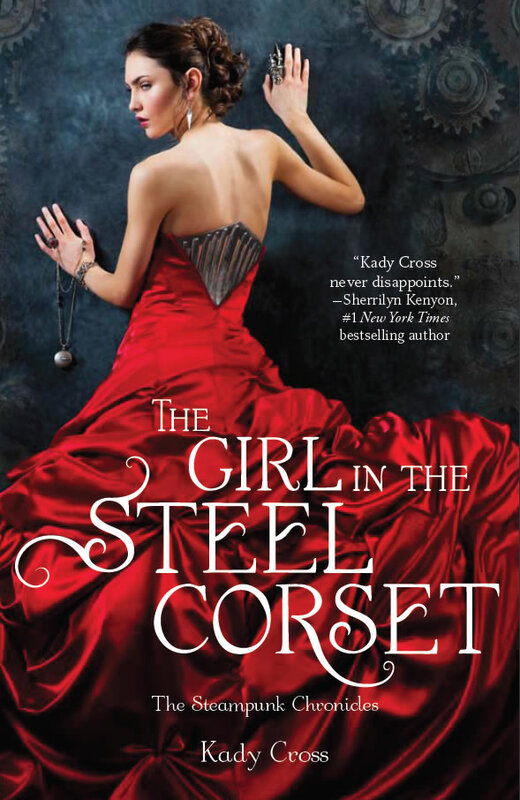 I have an ARC of The Girl in the Steel Corset to give to one lucky reader. Just comment in the box below. Contest ends Sunday, May 8th at 11:59 PM PST. Open internationally. This month on the STEAMED! blog we’re going to declare it Fantastic February. We’ll be looking at the fantasy element in fiction. However, this post is where real life intrudes. There is no doubt that the wonders of the Victorian age were splendid, but there was one thing that did take time and wasn’t so very progressive – the mail. In this one instance alone (ok, that and perhaps dental hygiene) I am so very grateful for the wonders of the modern age, including the Internet and email. Let me say, you don’t know what you have until you lose it. As I mentioned the book is out TODAY and available on Amazon, Barnes and Noble, Borders, Books A Million and bookstores everywhere. Also available at eharlequin both in print and as an ebook. If you’d like to take a mini-fantasy vacation of your own, you can even read a first chapter and visit Olivia’s webpage, click here.